It has been almost a year since we took a FirstUse look at Digital Foci’s PhotoBook. Today’s better digital cameras, larger memory cards, and simpler ways to share the images have resulted in people taking more photos than ever. How we take our images (cell phones, digital camcorders, etc…) may have changed over the years. What has not changed is the interest in finding new ways of viewing, displaying, and enjoying them with friends and family. Most can now email them from our cell phones, post them on social sites, and show them as a slideshow on the LCD TV. However, there is something special about holding a photo album in your hands and flipping though the pages at your own pace. A year ago, Digital Foci’s PhotoBook was the only digital product which was able to satisfy that desire. Today, with Apple’s iPad, one can do pretty much the same thing as the PhotoBook and much much more. So, is Digital Foci’s PhotoBook obsolete? Today we’ll take an InTheWild look at the Digital Foci PhotoBook and see how it stacks up a year later. 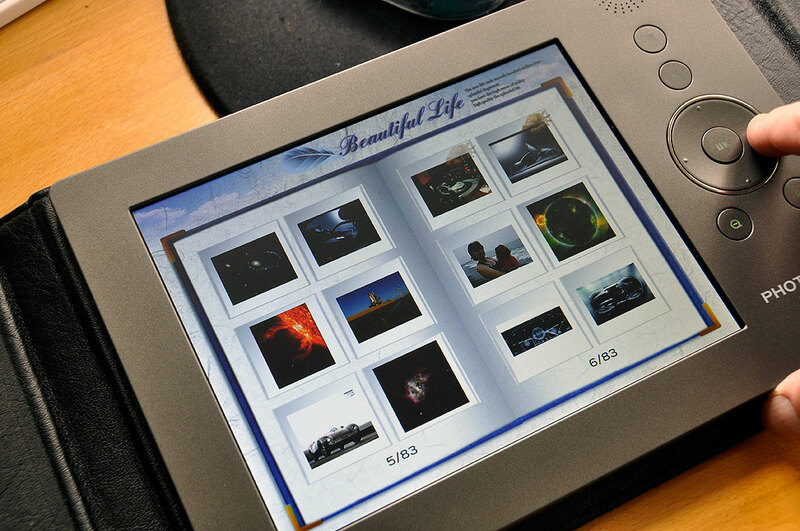 From the user-interface perspective, the PhotoBook‘s features are quite dated: manual scrolling via physical buttons, limited themes for displaying photos, and no ability to reorganize the images. However, the device is still quite capable. Its LCD display is large (8″) and the resolution (800×600) is adequate. It has a built-in speaker and an integrated cover. While the screen resolution is not as high compared to the iPad, the color and contrast is pretty high quality. The PhotoBook has direct support for most of the popular memory card format (CF, SD SDHC, MMC, Memory Stick, MS PRO, xD). This is the one area where the PhotoBook is better than the Apple iPad. With the iPad, an external connector is required for direct transfer of images from a memory card onto the tablet. The PhotoBook’s built-in card reader is much more convenient to use than the iPad’s dock. It also won’t get lost or get left behind by mistake. The PhotoBook is much thicker than an iPad, but only if one compares the devices as they are out of the box. Most iPad users protect their tablet with a case of some sort. If we put the iPad in a leather folio, the two are become almost identical in size and thickness. 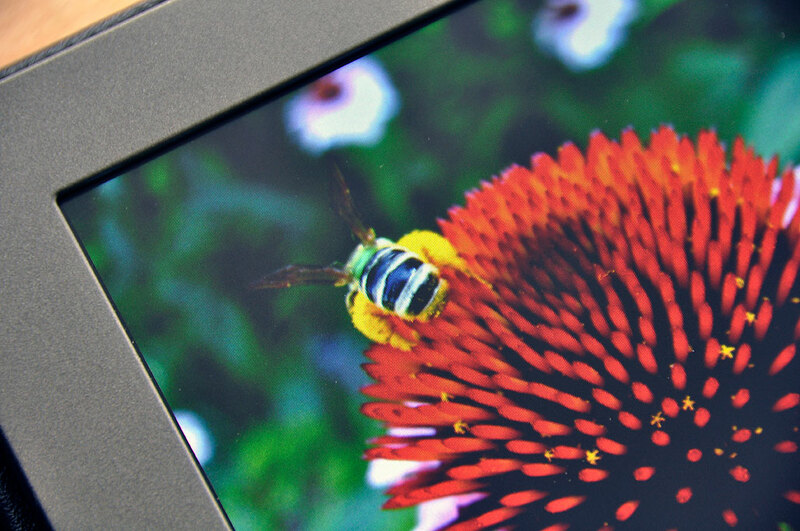 Given the price and what is available on the market today, for those who just want to display photos, a digital picture frame such as the Kodak Pulse may be a better choice. However, while the Digital Foci’s PhotoBook is clearly showing its age, with its workable resolution and more convenient docking options, it can still be a viable option for someone who needs a portable photo viewer. So, if you don’t want to cough up $500 for an iPad, but do want a large viewer for use in the field, the PhotoBook can be a worthwhile piece of gear to add to the travel bag.